This Honeyed Fruits and Nuts Recipe is so very easy to prepare, but a delight to give and receive. It is delicious over your morning oatmeal or yogurt, makes a great topping for pancakes and waffles or ice cream. It is lovely served alongside pork and with cheeses. Recipe and Video included. Arrange the figs, bottom side down and cut side out, along the bottom fo the jar, using the honey to 'glue' the figs to the side of the jar. Fill the space behind the figs with your choice of fruits or nuts. I like the contrast that the pistachios give. Continue adding layers of fruits and nuts, topping each layer with a little honey. After letting the honey settle, you may need to go back and top off your jar with a bit more honey. You want everything to be covered with honey. If adding rosemary, put it in the middle of the jar, ensuring that it will stay covered with the honey, which acts as a natural preservative. 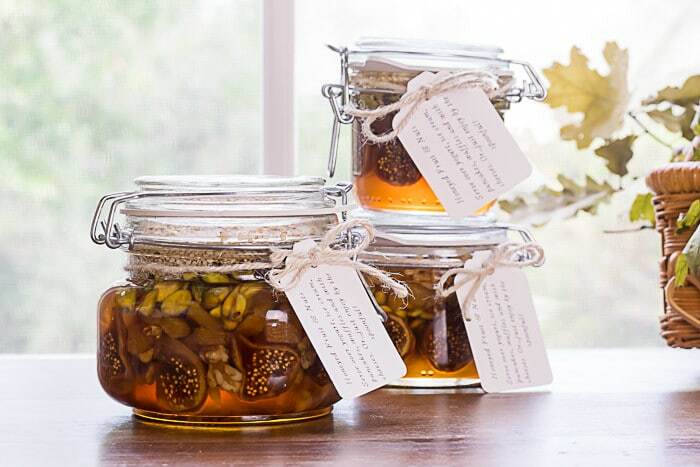 A jar of honeyed fruits and nuts makes a lovely and unique food gift during the holidays, or anytime. And make sure to keep at least one jar for yourself…your morning oatmeal, yogurt, waffles or pancakes will never be the same. And, this honeyed fruits and nuts recipe could not be any easier! But truthfully, I'm a little hesitant to put the label of ‘recipe' on this…treat. It's almost like a recipe for a bowl of cereal…you know what I mean? Nevertheless, label it a ‘recipe' I will. You can customize this Honeyed Fruits and Nuts Recipe any number of ways. You could go straight Honeyed Fruits or Honeyed Nuts. I've sliced my figs in half, but you could also add more diced figs. Prefer almonds over walnuts…have at it. I also added a sprig of rosemary to my honeyed fruits and nuts recipe because, well…rosemary. If you do add an herb, make sure it is well covered with honey. Honey acts as a natural preservative. I used the 7.75 ounce Hermetic Storage Jars from The Container Store (I like the easy swing lid, but any jar would do. 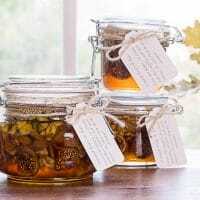 I also attached a little note with the jar giving suggestions for using the Honeyed Fruits and Nuts. So easy to prepare, but so delicious to eat and lovely to give…you can't beat this Honeyed Fruits and Nuts Recipe. Bookmark this page for your future reference or pin the following image. Looking for some other ideas for ‘Gifts From The Kitchen'?